News releases from REI have stated that 2015 has been one of the best years for the co-op in regards to active membership and sales. To further enhance the store experience the Store Design and Visual Merchandising team launched the campaign, Softgoods Refresh. This summer they selected several departments in over twenty stores to overhaul and design a new innovative visual customer experience. To comply with my non-disclosure agreement, I have omitted and obfuscated confidential information in this case study. The information in this case study is my own and does not necessarily reflect the views of REI, Inc. In mid 2015 I was a graphic design and user experience contractor for REI, Inc. at their headquarters in Kent, WA. While there, I was the lead designer on several special projects within the Store Design and Visual Merchandising department. I pitched an alternate strategy to better relate the information to the store employees and visual merchandisers. I created wireframes, sitemaps and prototypes for the application keeping in mind the spatial relationships between new design areas and departments and how one many have to jump from one section of the app into another. I designed the format and created the interactivity for all twenty apps that were launched for the 2015 Softgoods Refresh campaign based. I collaborated with a visual merchandiser who provided the artwork images of what was going into the stores. From there I created a visual strategy which would put the images in context be it on a wall or a fixture. For this project we looked at twenty individual stores and created twenty specific visual merchandising plans, which meant we needed twenty apps that would show exactly what should be replicated in store. Our goal was to create an app that would show the store employees how to set up the new designs but also inspire them by showing them exactly how their store could look. We wanted a portion of the app to be interactive so that they could enter into their own store’s departments and see the artwork in relation to their floor plan and fixture set up. After being assigned this project I pitched an alternate visual design strategy that harnessed 3D capabilities and put it into an interactive app, which had not been done in the department’s history. After building a prototype it was elevated to upper management and later approved. When designing the iOS app, I used Adobe DPS to create the framework, design and interactivity. After being approved it was launched using the same program. 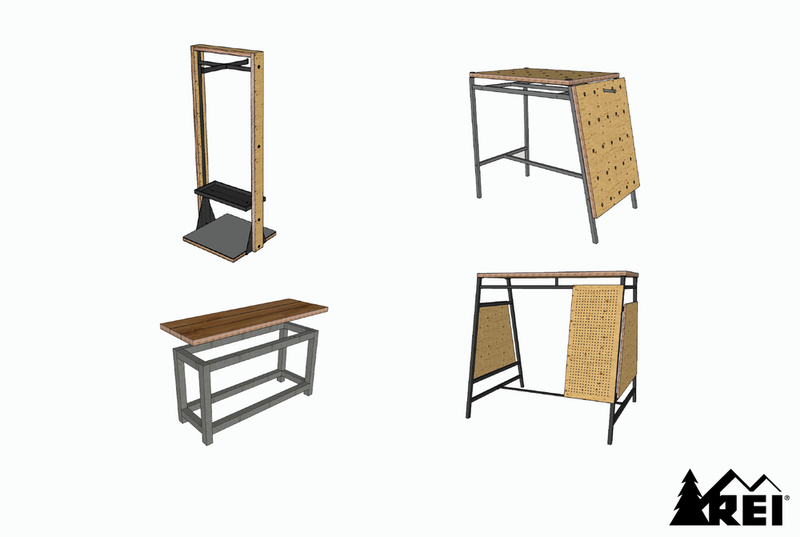 While working with the Fixture and Store Evolution team I created 3D prototypes of potential fixtures to send to vendors that I later used for the Softgoods Refresh campaign. 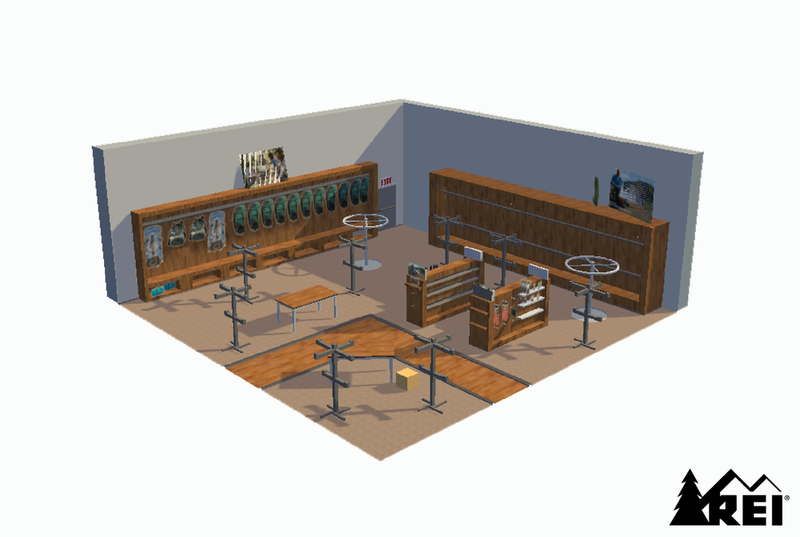 I then combined existing 3D fixtures with the finalized prototypes I had created in SketchUp into 3D replicas of all twenty stores and added the artwork provided by the visual merchandiser. The app structure was based off of a map of each store from which the user could enter any area to see it on a departmental scale and then select individual sections to enlarge the artwork and see item numbers and exact sizes. When an fixture was split between two departments the item could be selected from either to create a fluid user experience. This product was launched on a rolling basis in time for each campaign at the various stores. They were the instruction manual for each store and created a smoother transition from the old merchandising strategy to the new.